How Many Of Us Have Sacrificed Our Children to Idols! We may plead guiltless as to the shedding of the blood of the body — but there is the blood of souls! How many of us have sacrificed our children to the idols of the present Canaan — fashion, custom, dress, amusements, and worldly conformity in general! Look at the poor example we give them! Look at the worldly company we choose for them! Look at the carnal practices we allow them to indulge in! 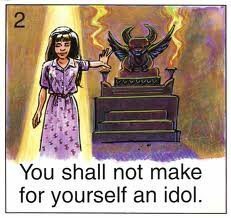 O how many of our children have been sacrificed to custom, fashion, and the various idols of the world! don't forget the pagan days that people sacrifice their children to, too. x-mess, bEaster, hallowed-weenie, ect. look at the origins of all the christian celebrations, everyone is based on pagan practices from long long ago.